My flight from Washington, DC, to New Orleans on the first Friday of August was delayed for seven hours by mechanical problems, so instead of getting to my hotel in time for happy hour in the French Quarter, I arrived at 1:30 AM, exhausted. The next morning, I headed for Café Beignet on Royal Street, and got drenched by a Saturday morning tropical downpour. I was here for the annual conference of the Ecological Society of America, held at the Convention Center from August 5th to 10th. I arrived early to go on two pre-conference field trips, the first of which was Saturday afternoon, a canoe trip in the Manchac Swamp. After a 45-minute bus ride west on Interstate 10 and then a little ways north of LaPlace on the old highway along the western shore of Lake Pontchartrain that parallels Interstate 55, just before we reached the town of Ruddock, we rendezvoused with the canoe outfitter with whom David White, the organizer of the trip, had arranged to get us onto the water and into the swamp. 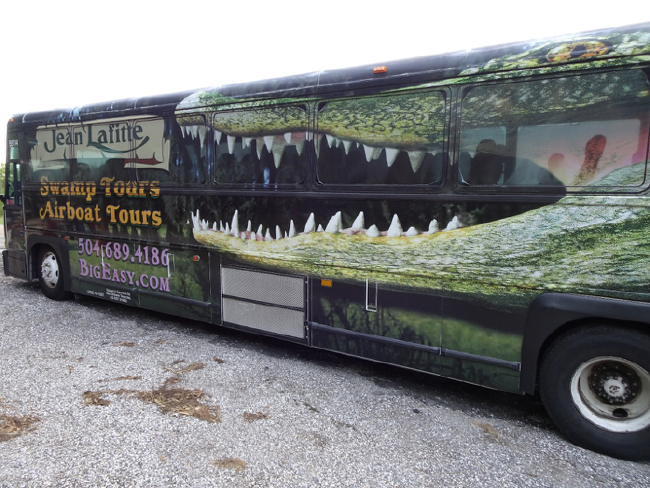 The bus to the Manchac Swamp, 4 August 2018. We paddled under Interstate 55, under the Manchac Swamp Bridge – supposedly the longest bridge on the U.S. interstate highway system at 23 miles long, and one of the the longest bridges in the world over water. I could hardly believe this until a week later, as I was flying out of the Louis Armstrong International Airport, where from my window seat I could look down on the “landscape” west of New Orleans as we climbed right over the Manchac Swamp and circled to the east. It was a waterscape more than a landscape, and the city of New Orleans was an artificial aberration hugging the leveed Mississippi for dear life, like a kid who can’t swim might hug a life preserver. 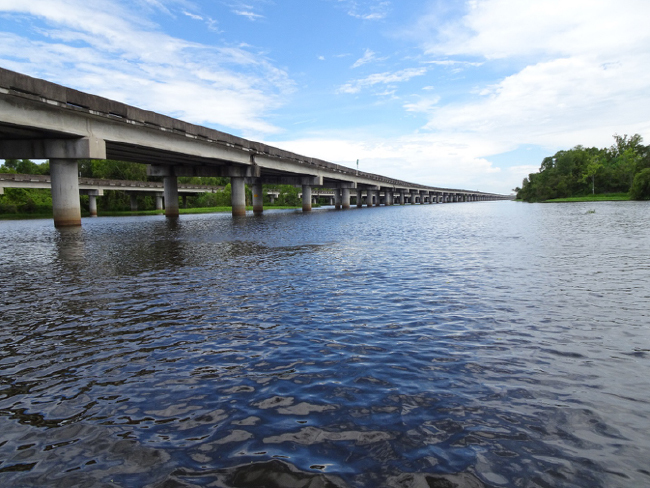 The Manchac Swamp Bridge carrying Interstate 55, photo from my canoe, 4 August 2018. When we crossed under the bridge, we entered the Maurepas Swamp Wildlife Management Area, and began to see large baldcypress scattered along the water we were paddling, festooned with long streamers of pale gray-green Spanish moss. 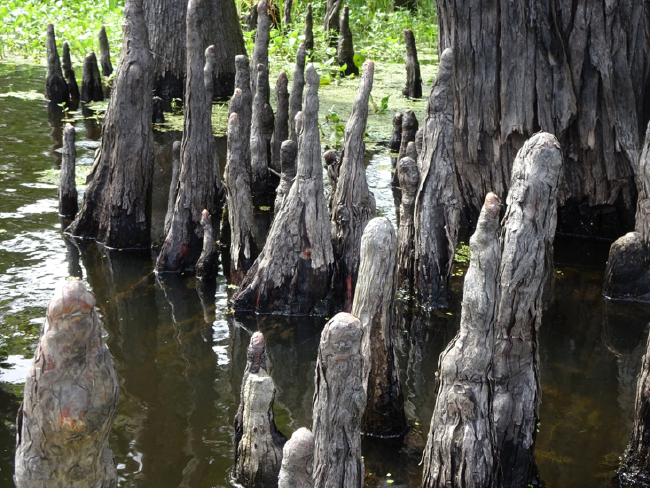 Baldcypress (Taxodium distichum), with its buttressed trunks surrounded by phallic root-projections often called cypress “knees,” are the iconic tree of these southern swamps. Equally iconic “Spanish” moss, a delicate “air plant,” is a member of the South American family Bromeliaceae to which pineapples also belong. It is a reminder of the ecological re-acquaintance of North and South America that followed the long estrangement of their biotas during the tectonic divorce of Laurasia and Gondwana. Since their reconnection through the Central American land bridge, the Gondwanan bromeliad we call Spanish moss (Tillandsia usneoides ) has “invaded” northward, and now it is hard to imagine baldcypress or live oaks in the South not draped with this species. 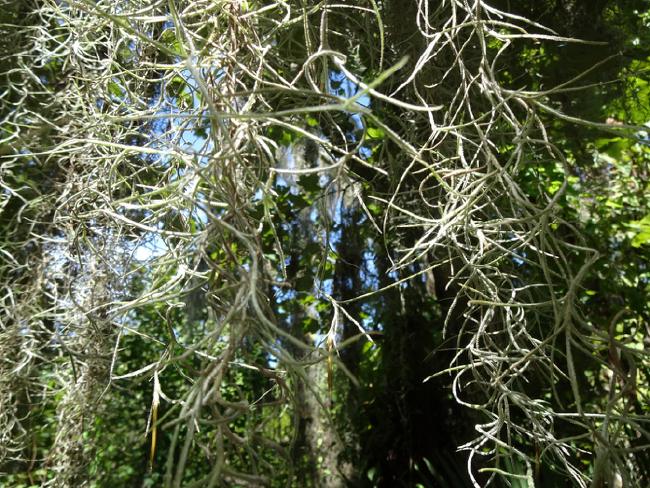 Close-up of Spanish moss, Tillandsia usneoides. It is hard for an outsider, even an outsider ecologist, to read the vegetation here for clues about its ecological history. At first, we paddled along a wide and straight channel, probably a canal cut in the heyday of baldcypress logging for transporting timber out of the swamps. Baldcypress lumber, easy to work and rot-resistant, built New Orleans. In some stretches we travelled along smaller straight canals dredged for access to oil and gas wells, but in some places we were traversing old river channels, like Shell Bank Bayou, where the curving water and huge old baldcypress on the banks gave clues that this was a more natural condition even to non-local ecologists. One giant baldcypress had an informational sign on its trunk that stated that it had been standing here when the area was acquired in Thomas Jefferson’s Louisiana Purchase in 1803. I guessed it could have been a substantial tree even then; but it was showing its age – a huge side-branch had been broken off, probably during a hurricane. 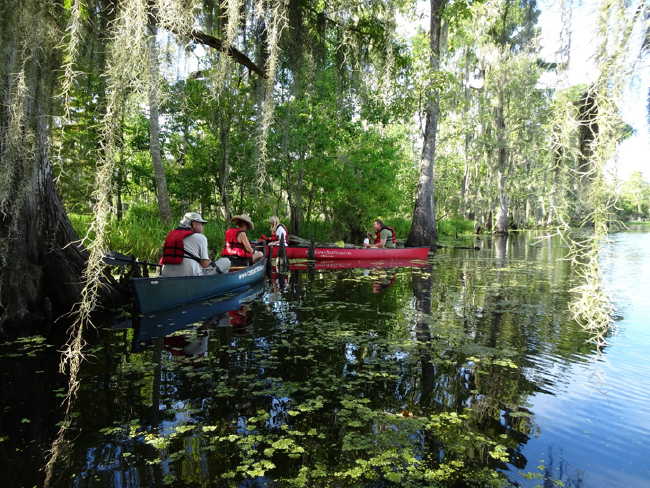 Ecological Society paddlers under the “Louisiana Purchase” baldcypress. After we had a chance to enjoy the swamp scenery a bit, David White pulled our flotilla of canoes to the side of the channel for our first on-the-water ecology talk. A wetland ecologist from Loyola University in New Orleans who has spent his career studying the swamps and marshes of the Mississippi Delta, he was an excellent guide for this group of ecologists. 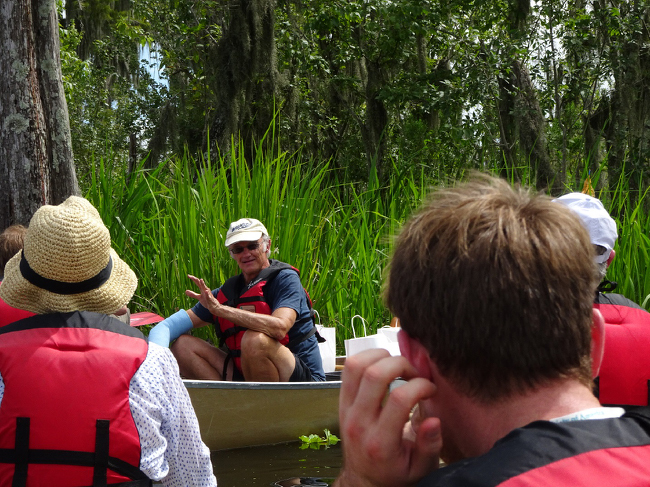 Field trip organizer David White giving a swampside tutorial, 4 August 2018. First theme: Invasive species. In the literature on threats to biological diversity worldwide, invasive species are always one of the top five major threats, but usually listed among the bottom three, after habitat loss and overexploitation of a particular species. Depending on the place, invasive species usually wrestle for significance with pollution and climate change for position three. Scientifically speaking, invasive species and ecological “invasiveness” are fascinating. Non-native invading species create natural experiments – well, or maybe unnatural if you count their introduction as unnatural events – that allow ecologists to try to understand some fundamental aspects of the structuring of ecological communities and the patterning of ecosystems. For example, if an introduced species can insert itself into an ecosystem that some ecologists might see as a natural, balanced product of evolution, and disrupt it significantly – why? How is that possible? There must have been some ecological “niche” – a way of making a living by a species in that ecosystem – that was open and available, or not completely filled, by a native member of the community. Another way to describe the potential of “invasiveness” might be as a “vulnerability” in the “balance” of that ecosystem. But then, questions are immediately raised in the minds of ecologists about whether ecosystems are really functionally “full” of species, or in “balance” at all. And that raises all kinds of questions about time scales and about human influences on the factors that affect ecosystems. It’s a Pandora’s Box, a can of worms… a Manchac Swamp. The Mississippi Delta is a great place to ask these questions, and ecologists like David have been seeking, and continue to seek, answers here. It’s as full of invasive aliens as it is of native alligators, jazz musicians, Cajun cooking, and voodoo legends. One of the first ecological aliens we encountered was water hyacinth, Eichhornia crassipes, a native of the Amazon Basin that has become highly invasive in tropical and subtropical wetlands worldwide. A fleshy, floating perennial plant with showy lilac-purple flowers, it was introduced in Louisiana in 1884, reportedly through plants from Brazil that were distributed as mementos at the World Cotton Centennial Exposition of 1884 in New Orleans. 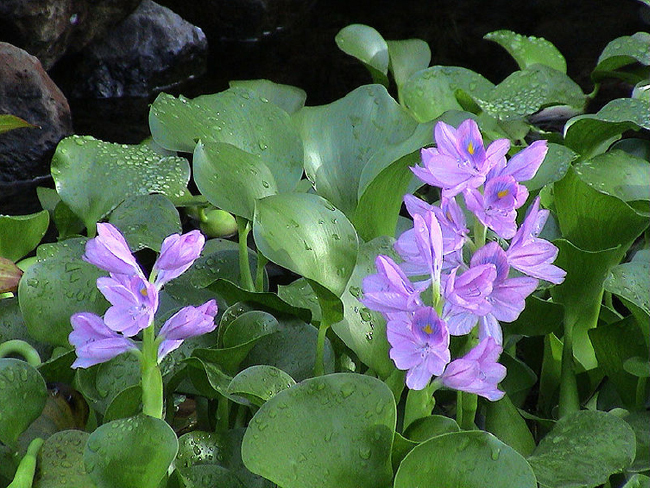 By 1890, infestations of water hyacinth were reported across the southeast and even as far west as California. Water hyacinth, Eichhornia crassipes. Photo by W. Hagens, Wikimedia Commons. Mechanical and chemical control of water hyacinth is generally expensive, polluting, and ineffective, so ecologists turned to a commonly-used strategy: Find a natural pest or predator of the invasive species from its native ecosystem and introduce that in the new habitat also. This kind of ecological tinkering is not without its own risks – namely, what if the introduced species also likes to eat important native species, or even economically-valuable agricultural ones? Deliberately introducing a second non-native species to control another invasive one could have serious unintended and unwelcome consequences. Two weevils from Argentina that feed on water hyacinth, with the cool scientific names Neochetina eichhorniae and Neochetina bruchi, were identified as potential biological control agents. Both of these weevils are specialist herbivores that only eat water hyacinth, and they have developed a method of pupation underwater that is dependent on specific characteristics of the root system of their host species. The tight coevolutionary bond between water hyacinth and these Neochetina weevils gave ecologists and wetland managers the confidence that they would not have unforeseen and unintended consequences, and they were introduced into Louisiana and other Gulf Coast states by researchers from the U.S. Department of Agriculture in the 1970s. A decade later, according to researchers from Louisiana State University, water hyacinth populations were reduced by a third. David White told us that by about a decade ago they were uncommon in many areas, but now are becoming a problem again, as efforts to continue releasing water-hyacinth weevils have faltered from lack of funding. The weevils have not become naturalized, apparently – not, that is, become a permanent self-sustaining part of the ecosystem – and they must be periodically reintroduced to maintain their populations and gobble up water hyacinths. Another conspicuous invader on the waterways we paddled is a floating fern from the Amazon Basin, whose scientific name is Salvinia minima. It covered large percentages of some waterways in the Manchac Swamp. 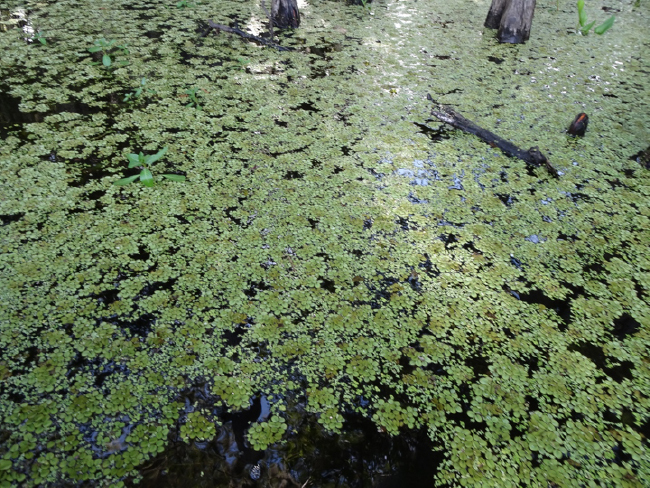 Amazonian floating fern, Salvinia minima, in Manchac Swamp, 4 August 2018. 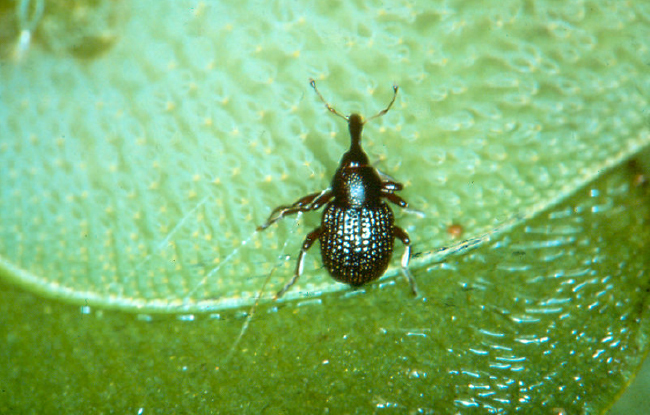 Biological control has been the strategy used against this aquatic invader as well, and again the potential control agent is a weevil found in the Amazon. The salvinia weevil, Cyrtobagous salviniae, feeds only on water ferns in the genus Salvinia, and researchers from Louisiana State University have not identified any negative effects on native species. In some places the weevil has cleared infestations of Salvinia by 90% or more in one year. Cyrtobagous salviniae, the salvinia weevil. Photo courtesy of Wikipedia. 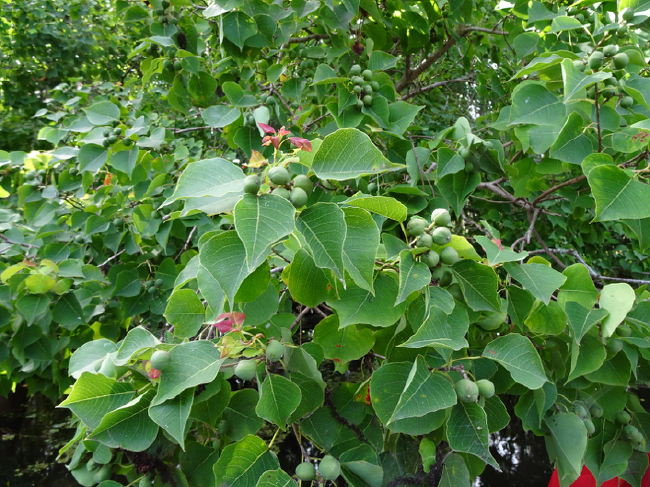 Last but not least among the invasive plants we paddled among at Manchac is Chinese tallow tree (Triadica sebifera). A native of eastern Asia, it has become naturalized in the U.S. southeast and the entire Gulf coast, and can readily invade wet, disturbed areas, preventing the regeneration of, and crowding out, native species. It was the dominant vegetation along the spoil banks of some of the canals we paddled on. Chinese tallow tree, Triadica sebifera. Paddling up close to a thick stand of Chinese tallow trees along the bank at one point revealed something remarkable to the ecologists in the group. None of the leaves of these trees had a single nibble, chew, hole, or missing margin. Next time you are in your local woods for fields, take a look at the leaves of the native plants there, and I bet you can hardly find one without some damage to its leaves from hungry insect herbivores. But not a one of the thousands of Chinese tallow leaves we examined had even one bite take out of it. That lack of insect herbivores could be one ecological reason it is such an aggressive invader. What might explain it? Chinese tallow tree is a member of the plant family Euphorbiaceae, and euphorbs, as they are commonly called, have milky latex sap – the rubber tree, Hevea braziliensis is a euphorb – that is often full of toxins of various kinds. Both the sticky sap and the toxins are defenses evolved to thwart herbivores, including insects. And, apparently, no native North American insect has the guts and gumption to eat Triadica sebifera. Because Chinese tallow tree is such a recent member of the local ecosystem, natural selection has not had the chance to work its magic to aid and abet the evolution of something that can eat this abundant new food source. But don’t worry about the creativity of evolution – check back in a century, a millennium, or a million years. Something will be chomping on Chinese tallow tree and keeping it in its place in its new home ecosystem. Another factor in Chinese tallow’s success as an invasive species is surely its amazing reproductive ability. Tallow trees can begin producing seeds within three years, and larger trees can produce tens of thousands of seeds each year. The seeds are coated with a vegetable wax, resembling tallow, which has been used in Asia for making candles and soap. Birds are attracted to eat the seeds because of this high-energy coating, and then disperse them over wide distances as they fly and defecate. David described it as a “rain” of Chinese tallow tree seeds that now covers the southeastern United States. It is estimated that the area covered by Chinese tallow has increased 500 percent in Louisiana in the last two decades. But, guess what the most promising strategy is for controlling Chinese tallow tree? (This shouldn’t come as a surprise by now.) The U.S. Department of Agriculture (USDA) is evaluating a flea beetle from China, Bikasha collaris, as a natural control agent. Another example of a tightly coevolved plant-herbivore relationship, Bikasha collaris generally ignores other plants as it eats the roots and leaves of the tallow tree. This host-specific relationship was tested on about 150 other plant species in a decade of laboratory work in the U.S. and China before considering introducing the beetle to the U.S., an excellent example of applying the precautionary principle when thinking about messing with ecosystems. How easy it is, in our ecological ignorance, to screw up ecosystems and create unintended and unwanted consequences. The stage is now set for the possible release of these beetles. The USDA’s Animal and Plant Health Inspection Service has been working on an environmental impact assessment. If approved, beetles may be released this year, in 2018. So far, I’ve only mentioned a few of the most aggressive and invasive plants found in the Manchac Swamp, but there are invasive alien animals as well. At the top of the list is the nutria, Myocastor coypus. Nutria were imported from South America for fur farming in Louisiana, and through escapes or deliberate releases from some farms, they became established in the wild beginning in the 1930s. Since then they have spread across the southern U.S., with significant effects on the ecology of swamps and marshes. Nutria are, in some places, the principal vertebrate herbivores and limit plant growth. As such, according to a recent study, nutria magnify other threats to swamps and marshes, such as the loss of nutrient and sediment inputs that formerly nourished them caused by the taming of the Mississippi by levees, and by saltwater intrusion from climate-change-caused sea level rise and more frequent and intense hurricanes. OK, so South American nutria have invaded North America. How unfair is this “global trade” issue? It turns out that our continent has reciprocated by sharing the North American beaver, Castor canadensis, with South America. Our beaver is now an alien invasive species in Patagonia. Just desserts? When it comes to ecological invasions, I’m not sure that the concept of reciprocity applies, although any reports I’ve read sound like the beaver is much less abundant and damaging in Patagonia than the nutria is in Louisiana. But let’s go back again to that hierarchy of threats to biodiversity I mentioned earlier: Habitat loss, overexploitation of a particular species, pollution, invasive species, and climate change. 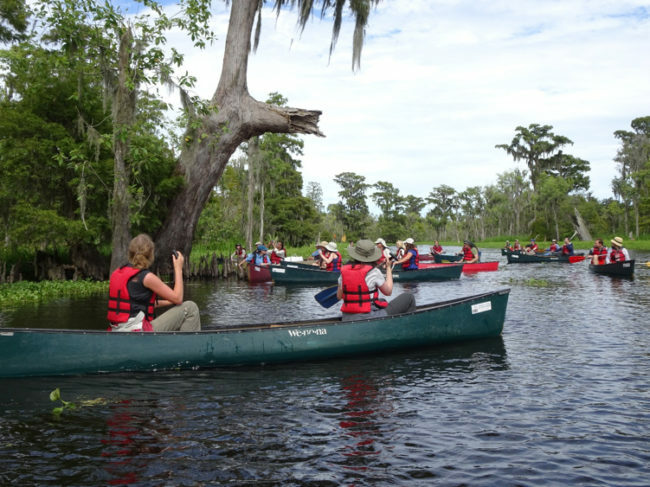 A second theme of our paddling field-tutorial on the ecology of Louisiana’s wetlands was about what are, in most places, the top threats to biological diversity: Habitat loss, and overexploitation of a particularly valuable species. These usually jockey for Threat #1 and #2. In the Manchac Swamp they are closely linked. Overexploitation of baldcypress for lumber probably started the cascade of biodiversity loss here. Before Europeans arrived, baldcypress would probably have formed a closed-canopy in this area, David said. That is, the upper branches of giant baldcypresses would have been overarching and touching; three centuries ago we would have been paddling through natural bayou channels and lakes under a cathedral of complete shade. But after the extensive logging of baldcypress, the ecosystem lost its dominant, keystone species, and lost its balance. And now, climate change has risen up, like King Kong climbing the Empire State Building, to present a new threat to the structure of the ecosystem. The old, tall baldcypresses left after severe logging are now the tallest things around in hurricane winds. They have been broken off and decimated by recent hurricanes like Katrina in 2005. And according to David, their ability to reproduce and recolonize these swamps are now threatened by nutria, which apparently find baby baldcypresses an especially tasty appetizer. Ecologically speaking, it was clear in our first half-hour of paddling in the Manchac Swamp that the times, they are a changin’. Our turn-around point after about three hours of paddling on that steamy and sunny August afternoon was a “lake” – the local name for a wider and deeper area along an old bayou. We ate a late lunch tucked into deep baldcypress shade. No one talked much. Like me, I think we were all trying, somehow, to reconcile the lushness and beauty of life here with a deeper, disquieting sense that this ecosystem was changing fast because of our own species and its actions and choices. Our paddle in the Manchac Swamp combined a sense of wonder at the grandeur of the giant baldcypresses still standing after centuries, with a strong sense of surprise at the ecological changes resulting from human activities. The change being wrought by non-native, invasive species, transported from far corners of the planet either accidentally or deliberately, was dramatic and visible – the impacts of ecological “globalization” are front-and-center here. But the harder-to-read ecological changes, from a closed-canopy baldcypress swamp to a canopy-less, hurricane-blasted wetland, were equally alarming. The thought crossed my mind: Maybe we are the ecological aliens, destined to disrupt forever the ecosystems our species invades. Only later, when googling for more information on the Manchac Swamp, did I discover a story of the cultural history of the place. I learned that Manchac is, according to local legends, haunted by the spirit of a voodoo priestess named Julia Brown. She lived in the town of Frenier, just south of where we put our canoes into the water along I-55, at the end of the 19th century, when a number of prosperous towns between the Manchac Swamp and Lake Pontchartrain were sustained by lucrative baldcypress logging. Julia Brown is described in the local legends as a voodoo priestess who lived at the edge of the swamp; she was known for her healing charms, her curses, and for playing her guitar and singing eerie songs on her porch. Towards the end of her life she was angry at her neighbors because they were “taking her for granted,” say the stories, and a phrase in one of her songs said: “One day I’m going to die and take the whole town with me!” On the day of her funeral, September 29, 1915, a massive hurricane struck the New Orleans area, with winds of 125 miles an hour and a storm surge of 13 feet. The hurricane disrupted the funeral proceedings and destroyed the town before her interment, and according to one version of the story, her body was never found, only her empty casket. One night in the middle of the Ecological Society conference, I needed an escape from the scientific intensity of the meeting, and found myself deep in the French Quarter. But thoughts of the paddle in the Manchac Swamp were still with me, unshakeable. The neon sign for Reverend Zombie’s House of Voodoo, across St. Peter Street from Preservation Hall, drew me into the store. I spent a long time searching for a voodoo doll that might somehow represent an invasive species, or for a spell against climate change – for some kind of power or magic that could control or lessen our human assault on the ecosystems that have always sustained us. Maybe just one of those generic voodoo dolls made for tourists to “make a wish”? But nothing caught my eye, nothing seemed quite right. 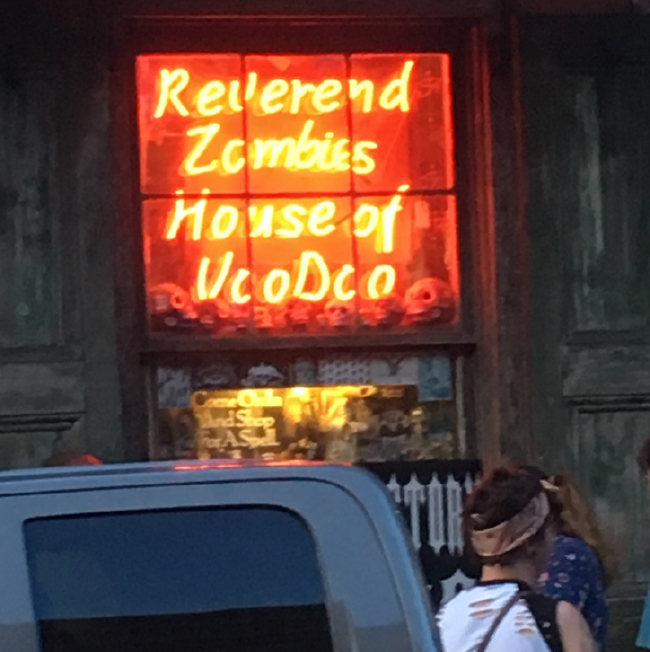 Reverend Zombie’s House of Voodoo, New Orleans. Only later that night did I finally realize the message of Manchac. Julia Brown, the Voodoo Queen of the Manchac Swamp, lives on, of course – in the baldcypresses nurtured by her nutrients and alligators that incarnate her atoms, and now even in Amazonian floating ferns and Chinese tallow trees. Nature herself is our Julia Brown, and we better not take her for granted, or ignore her warnings. When she dies, she will take us all with her. So, let’s listen to her and respect her call for attention. And… if you can find a doll to put a pin into or a spell that can slow our disrespect for Nature – stick that pin in, call out that spell, before it’s too late! Walking on the Trembling Prairie. August 2018. Delta Blues: How to Walk on the Shifting Ground Beneath Our Feet. December 2016. The Astonishing World Under the Sky: Wandering with John James Audubon in Louisiana Woods. December 2016. Outer Banks Encounters. November 2013. Water hyacinth photo by W. Hagens, Wikimedia Commons. Chinese tallow tree, USDA/NRCS Plant Guide. ‘Super invader’ tree hits South, but flea beetle may be hero. Plaisance, Stacy. 2017. The host range and impact of Bikasha collaris (Coleoptera: Chrysomelidae), a promising candidate agent for biological control of Chinese tallow, Triadica sebifera (Euphorbiaceae) in the United States. Huang, et al. 2011. Wheeler et al. 2017. Quarantine host range of Bikasha collaris, a potential biological control agent of Chinese tallowtree (Triadica sebifera) in North America. Nutria, Eating Louisiana’s Coast. U.S. Geological Survey/National Wetlands Research Center. June 2000.